Disinflation is used to describe the slowing of price inflationInflationInflation is an economic concept that refers to increases in the price level of goods over a set period of time. The cause for inflation in the short and me. In other words, it is a decrease in the rate of inflation. The term should not be confused with deflationDeflationDeflation is a decrease in the general price level of goods and services. Predominantly, deflation is negative inflation. When it occurs, the value of currency grows over time. Thus, more goods and services can be purchased for the same amount of currency. 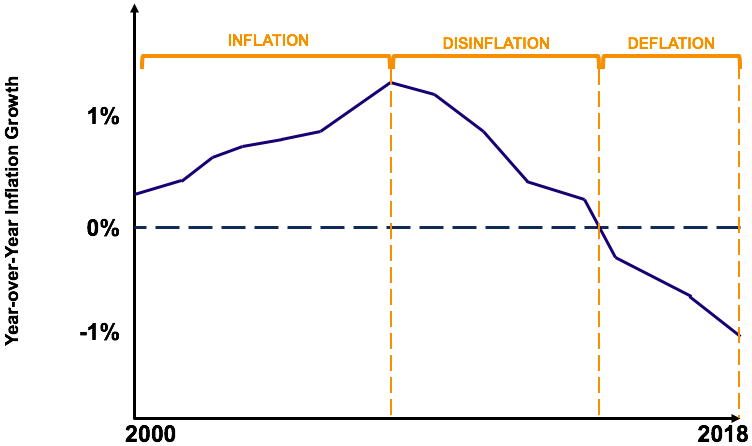 Deflation is widely regarded as an economic problem that can, which is used to describe a negative inflation rate. Disinflation: A situation where inflation increases at a slower rate. Deflation: A situation where inflation is negative (i.e., a decrease in the prices of goods and services in the economy). An easy way to quickly differentiate between deflation and disinflation is that the former is always negative while the latter is positive but decreasing. As shown by the graph, decreasing year-over-yearYoY (Year over Year)YoY stands for Year over Year and is a type of financial analysis that's useful when comparing time series data. Analysts are able to deduce changes in the quantity or quality of certain business aspects with YoY analysis. In finance, investors usually compare the performance of financial instruments on inflation is termed disinflation while a negative inflation rate is termed deflation. It is important to note that inflation is caused by an increase in the supply of money in the economy. Therefore, a slowdown in the economy’s money supply through a tighter monetary policy is an underlying cause of disinflation. In some cases, a slowdown in the rate of inflation can also arise during an economic recession. For example, in a recession, businesses may refrain from increasing their price levels to gain more customers (causing disinflation). A widely used measure of inflation is called the Consumer Price Index (CPI)Consumer Price Index (CPI)The Consumer Price Index (CPI) is a measure of the aggregate price level in an economy. The CPI consists of a bundle of commonly purchased goods and. The CPI measures the changes in the price level of consumer goods and services and is one of the most closely watched economic statistic among investors and the Federal Reserve. The percentage change in the CPI is used as a measure of inflation. If we take the percentage change of CPI from each year, the annual inflation rate can be determined. Using 2016 as the base year, the inflation for 2017 was 0.6% (102.3/101.7 – 1) and the inflation for 2018 was 0.3% (102.5/102.3 – 1). Since the inflation rates for 2017 and 2018 were 0.6% and 0.3%, respectively, it demonstrates a disinflation. From 2013 to 2015, the economy experienced rising inflation. Inflation was 1% from 2013 to 2014 and 1.1% from 2014 to 2015. From 2015 thereon, the company experienced disinflation. Inflation was 0.8% from 2015 to 2016 and further decreased to 0.4% from 2016 to 2017.